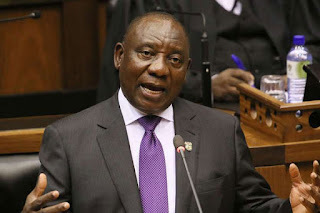 CAPE TOWN, SOUTH AFRICA (DAILY NATION) -- When apartheid ended in South Africa in 1994, Cyril Ramaphosa was expected to become the Deputy President to Nelson Mandela. But somehow, things did not work out, and Thabo Mbeki was named Mandela’s deputy. Mandela used political expedience to reward the son of his former comrade-in-arms, Govan Mbeki. Being a fellow Xhosa, Mandela thought that Mbeki was likely to continue his legacy and ensure the ANC survived a Zulu onslaught from the Inkatha Freedom Party (IFP). Ramaphosa remained patient, eased himself into business and waited for 23 years to become president. When Thabo Mbeki came to power, there were strong indications that he might name Ramaphosa Deputy President. He did not because there was fear that Ramaphosa was leftist and charismatic, and might outdo his boss. That is how the dice settled on low-lying party loyalist Jacob Zuma, who fought against the IFP challenge in Kwazulu-Natal. Mbeki would sack Zuma as Deputy President in 2005, only for the latter to defeat him in the ANC elections in Polokwane, and eventually become the president. In an article published in 1993 in World Policy Journal, Tom Lodge referred to Thabo Mbeki and Cyril Ramaphosa “as the “Crown Princes to Nelson Mandela’s Throne”, and his prediction has now been vindicated. Ramaphosa had been passed over twice. He was not Zuma’s first choice for deputy president, for obvious reasons. Zuma tried to use his ex-wife, Nkosazana Dlamini-Zuma, to fight off Ramaphosa, to no avail. Ramaphosa was an unlikely candidate for the political pundits for three reasons. First, he did not come from the majority Xhosa and Zulu ethnic groups. His Venda group is one of the smallest. Second, Ramaphosa had been a trade unionist and some thought that he might come into a collision course with employers. Third, there were those uncomfortable with his billionaire status. But many historians of political events and ideas had seen his rise very early and knew that it was just a matter of time. Ramaphosa is among the ANC leaders who came from the trade union movement. He was regarded as among those who held the ANC together at home during apartheid. Mandela had a soft spot for him, but some party insiders from the Xhosa and Zulu ethnic groups regarded him as a rank outsider, coming from the minority Venda. Like Julius Nyerere’s good impressions of Benjamin Mkapa and Jakaya Mrisho Kikwete that made them presidents in Tanzania, Ramaphosa had impressed Mandela, who said many good things about him. He was a member of the ANC reception committee when Mandela emerged from prison on February 11, 1990. He was left in the cold, but not for long because the political pendulum appeared to swing in his favour on July 1991, when he pulled off a major political coup, defeating Alfred Nzo and Jacob Zuma to be elected ANC secretary-general at the party’s conference in Durban. It was evident that the torch was being passed to the younger generation. His rise is one of the unique success stories against ethnicity, which many African countries have failed to eliminate. In Zambia, three of the presidents have been from the Bemba group. The Chibemba language is spoken by 33 per cent of the population. The Bemba vote determines who becomes president. In Malawi, the Chewa have had three presidents. In Botswana, the Tswana have produced four presidents at the expense of the minority Kalanga. As Barack Obama did in 2008, when he addressed racism in American politics, African politicians should target ethnicity as a major threat to democracy.